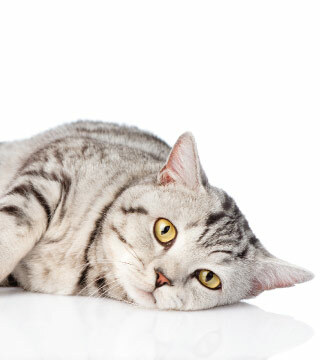 At Viera East Veterinary Center, we understand that feline cancer is a devastating diagnosis. It is natural to feel highly emotional. However, a cat cancer diagnosis is not necessarily a hopeless one. Depending upon how early it is identified and the type of cancer involved, there are certainly options that can lead to very positive outcomes. Our veterinarians and support staff are well trained, highly empathetic, and understand the importance of focusing on both the emotional and medical aspects of treating cats with cancer. We are here to work with you to make sure you have a good understanding of your cat's illness and to help you make decisions that will be best for you and your cat. Similar to human beings, cancer in cats is a leading cause of death among older felines. Although the specific causes of cancer in cats is currently unknown, many experts consider the feline leukemia virus to be a contributor. Other factors that might increase cat cancer include toxins from the environment, second hand smoke, and environmental toxins, and genetic predisposition. The first key to cancer treatment for cats is proper diagnosis. At Viera East Veterinary Center, we begin with a full physical exam. We commonly look at blood work and when necessary employ the use of diagnostic imaging such as radiography or ultrasound. We will also perform needle aspirates, which is a form of biopsy where a needle is inserted into the tumor to collect cells for use in determining tumor type. This is a non-painful and minimally invasive method used for diagnosis. Some tumor types require a core biopsy for diagnosis. In certain cases, cancer specialists may be employed for further diagnostic testing (such as MRI and CT scans) and to be part of our team in treating your cat's cancer. Complementary treatments may include acupuncture, immunotherapy, herbal or nutritional therapy.